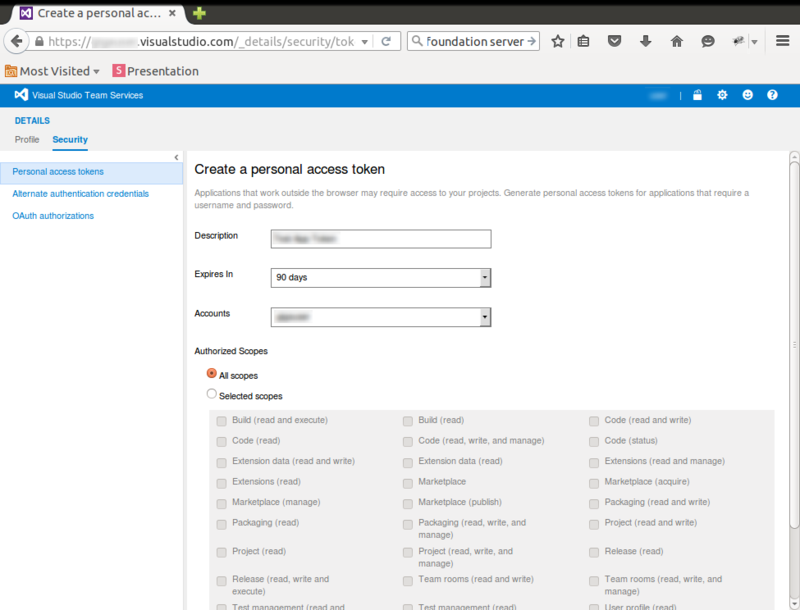 To integrate Test Collab with Team Foundation Server (TFS), you should have Team Foundation Server Personal access token ready with you. 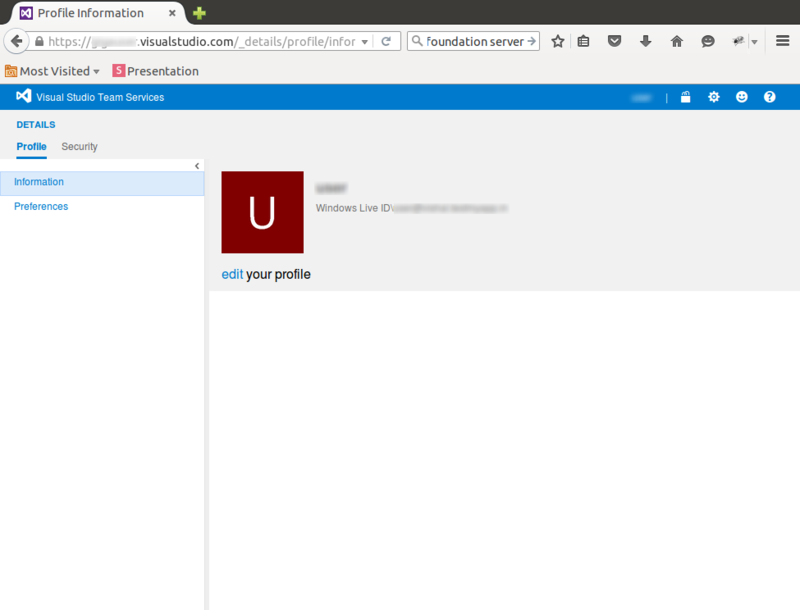 Being on TFS opt to edit your profile, You will be shown a page similar to the one being shown below. Under Security tab you would see the option to manage Personal access tokens , here "Add" option can be used to get a new token generated for use. Enter the Description and select values for "Expires in" make sure that you select a longer expiry to avoid frequent regeneration of token. Also select the scopes to match your needs, again please make sure that you provide sufficient privileges so that issues can be reported and set as resolved / closed from Test Collab. When you click the "Create Token" button, a new token will be generated and made available temporarily for copying. Make sure you get the new token copied as the same would not be made available again and in case you have not copied it then you would need to generate a new token. 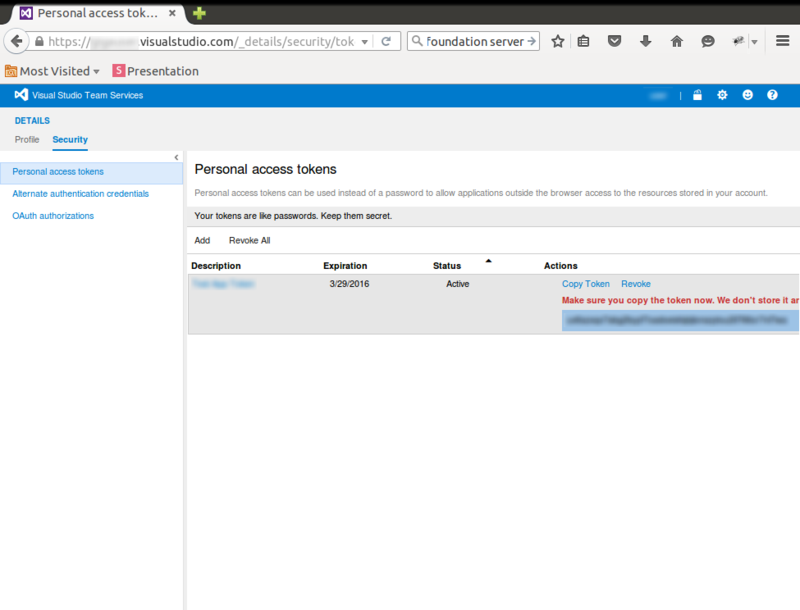 Navigate to Main Dashboard > Settings > Issue Manager and provide the Personal access token (in place of username) after selecting Team Foundation Server from the drop down available on the issue manager integration settings page. You also have an option of allowing the reported issue to be resolved / closed automatically when the related test case passes by checking "Resolve reported issues when a failed test case is marked as passed". When you check this you will be prompted to provide the status code that TFS uses for resolved issues, you need to enter the same for "Status code for resolved". For these fields lists of options will automatically be fetched from TFS on the basis of credentials provided by you during configuring application wide settings. 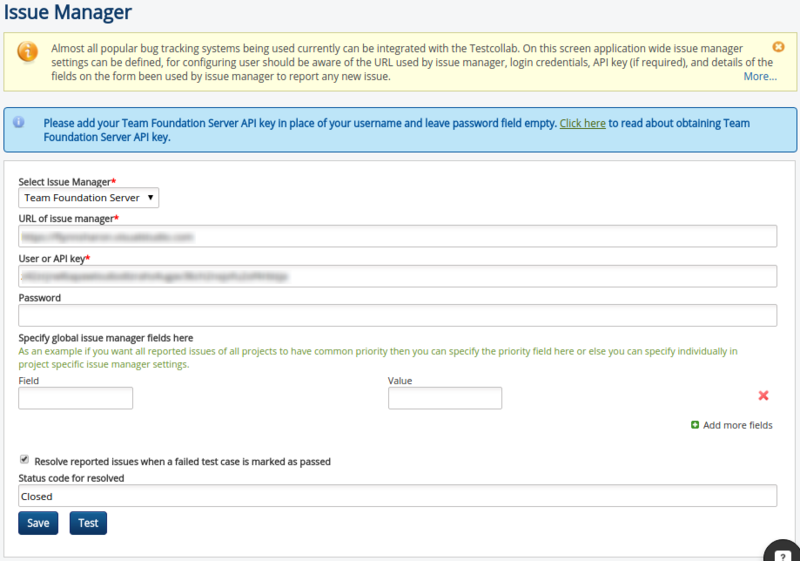 A completed project specific issue manager setting form for TFS would look like this. Once the values for all fields have been provided you can save and test the settings by creating a sample issue in Team foundation server. Once you have configured Team foundation server as an issue manager , bugs can now be automatically reported into Team foundation server if a test case fails while execution and the tester has opted to report. More information on this is available here. You can also get requirements from Team foundation server linked with test cases in Test Collab so that you can have a better traceability and coverage analysis. For details on requirements management please refer relevant user guide article.